Subaru Cherry Blossom Festival welcomes Tamagawa University Taiko Drum & Dance Troupe to Sakura Sunday! 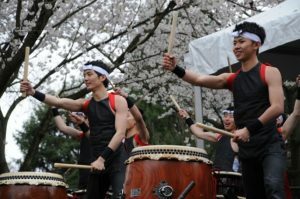 Tamagawa University’s world-renowned Taiko Drum and Dance Troupe returns to the Subaru Cherry Blossom Festival for their third year! Led by renowned kabuki dance instructor Noriyuki Hanayagi, the troupe fuses traditional Japanese festival dance choreography with heart-pounding percussions in a performance that will charm spectators of all ages. In addition to their performance at Sakura Sunday, Tamagawa University Taiko Drum and Dance Troupe will be performing at various locations around the Philadelphia area. Watch Tamagawa University Taiko Drum & Dance Troupe’s mix of heart-pounding drums and entrancing choreography at 10:45 AM & 1:30 PM on the Main Stage! To find more upcoming performances by Tamagawa University Taiko Drum & Dance Troupe, check out their Facebook page. Don’t see the performer you’re looking for? Check out our full list of performers here.